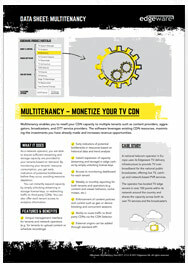 Monetize you TV CDN: Multitenancy enables you to resell your CDN capacity to multiple tenants such as content providers, aggregators, broadcasters, and OTT service providers. The software leverages existing CDN resources. This maximizing the investments you have already made and increases revenue opportunities. your tenants based on demand. By monitoring your tenants’ resource consumption, you get early indication of potential bottlenecks before they occur, avoiding resource depletion. You can instantly expand capacity by simply unlocking streaming or storage license keys, or redirecting traffic to third party CDNs. You can also offer each tenant access to analytics information.